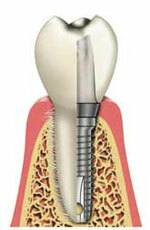 Dental Implants :: Precious Smile Dental Cosmetic Centre :: Surat :: Gujarat :: India. Endosteal implants (the most common type of implant) are similar to your tooth’s root and are surgically placed in the bone. Endosteal implants are generally used as an alternative for patients with bridges or removable dentures who want more natural looking and functioning teeth. Simply stated, a dental implant establishes a foundation for a tooth or teeth to be affixed to where previously there was none. The placement of implants is a surgical procedure, and the person must be in good health, have healthy gums, have good oral hygiene habits, and be committed for regular dental visits. If you suffer from systemic diseases (such as diabetes, HIV, etc.) or if you have inadequate bone to support the implant you may not be a candidate for the procedure. The success rate for implants is very high (usually 85% - 95%) and is continuously improving with new technology and materials, however if you are a smoker, have a problem with alcohol, have poor oral hygiene, or neglect to come in for regular check ups the success rate does decrease. If you are considering implants, medical history, dental history and dental examination by the dentist will help determine if you are a good candidate. Poor oral hygiene and tobacco are two major reasons why implants fail. It is important to floss and brush around the implant crowns at least twice a day and to stop using tobacco. The dentist will give you specific instructions on how to care for your implants. In addition, more frequent visits for additional cleanings may be required to ensure you retain healthy gums.